Romantic New England B&Bs with "Heart"
It's nearly time for Cupid to equip his quiver and make his annual Valentine's Day rounds. If you still have some prep work to do to plan a very special, romantic holiday for your true love, why not consider a romantic New England B&B getaway? Here's your guide to New England B&Bs with "Heart"--that is, New England bed & breakfast inns with "heart" or a close approximation in their names or locations. I've also dug up some great Valentine's Day package deals at some additional B&Bs throughout the region: You'll find them on page two of this article. Whether you plan to whisk your honey away on February 14 (a Tuesday in 2017) or delight your sweetie with a future trip to anticipate, these charming inns provide romantic accommodations throughout the year. What makes the Hartstone Inn a B&B with Heart? Innkeepers Mary Jo and Michael Salmon say: "Built in 1835, our Mansard-style Victorian Inn offers an enchanting hideaway in the heart of Camden. For the romantic at heart, the Hartstone features rooms with canopy beds, wood burning fireplaces, old-fashioned soaking tubs, luxurious designer bedding and the exquisite cuisine of our international award-winning chef. Five-course, candlelit dinners are served in our elegantly appointed dining room with fine china and crystal." Take a video tour of this romantic B&B at their Web site, and explore things to do in the Camden area. Never heard of Hart's Location, New Hampshire? I hadn't either until I heard about Notchland Inn, an 1860s-era granite mansion in this town with the romantic name. Surprise your sweetie by booking a late winter or early spring getaway. Innkeepers Ed Butler and Les Schoof offer this description of the inn's romantic possibilities: "Schussing together through quiet, snowy woods. Hiking to dramatic falls or secluded swimming holes. Seeking out that perfect antique for the home you share. Dining on wonderful food at a private, softly lit, table for two. Relaxing in front of the wood-burning fireplace in your room while snow falls softly or summer stars light up the night. Getting married in front of 50 friends and family or with just the two of you and Innkeeper/Justice of the Peace Ed Butler in the sight of the majestic White Mountains. Notchland is the 'Heart's Location' for hundreds of romantic occasions all year long." "We have a charming and warm inn, the perfect place to spend an intimate, quiet weekend with your loved one," says Innkeeper Danette Kerrigan. Hartwell House Inn is located just a short walk from Maine's rugged coast and close to the heart of all of Ogunquit's shopping and dining enticements. Surrounded by panoramic views of the majestic White Mountains, this 18-room inn listed on the National Register of Historic Places is a cozy place for a romantic getaway. The Valentine family has owned this peaceful Cape Cod B&B since 1910. 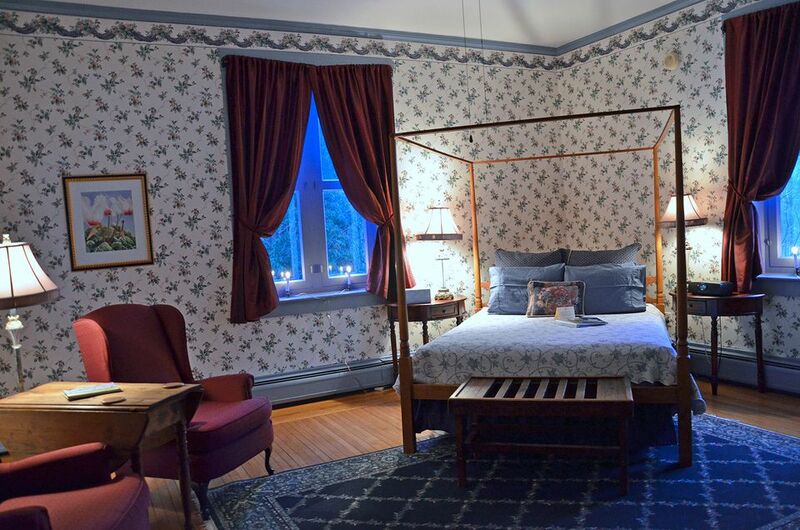 This 1886 Queen Anne Victorian B&B features five inn rooms and four carriage barn rooms and serves breakfasts featuring fresh Vermont ingredients. This Federal-period brick mansion turned inn in the petite, romantic-sounding town of Hartland has four guest rooms furnished with period pieces, plus gracious common areas including a tavern room and formal parlor. Stays include a gourmet breakfast. With live music Monday, Tuesday and Friday nights and open mic on Wednesdays at the nearby Skunk Hollow Tavern, everything you need for a memorable night away is right in Hartland. The two-night Love is Inn the Air Package available throughout the month of February at the Inn at Harbor Hill Marina in Niantic, Connecticut, includes a bottle of Prosecco and chocolates in your room, candlelit breakfast each morning, a $75 dinner gift certificate, two long-stemmed roses, two souvenir champagne flutes and your choice of two one-hour Swedish massages at nearby Massage Fusion Therapy Studio or a one-hour horse-drawn carriage or sleigh ride (snow permitting). Available throughout February, the Valentine's Day package at this intimate, three-room B&B is designed to help couples indulge. The two-night getaway, a perfect surprise for your Valentine, includes homemade chocolate truffles in your room, one spa treatment for each guest, a $100 dining gift certificate at a local restaurant of your choice and gourmet breakfast each morning. This B&B in the shoreside town of Camden prides itself on its breakfast menu, which features organic, locally sourced ingredients and always includes vegetarian, vegan and gluten-free options. For $49 in addition to your room rate, add the Cupid's Vegan Valentine package to your stay, and you'll also be treated to a vegan-friendly bottle of bubbly, locally made vegan chocolates and vegan afternoon snack cookies. And So It Goes... sort of! A tribute artist will headline a special Valentine's Day with Billy Joel and Elton John dinner dance at Maine's York Harbor Inn. Share a four-course dinner for two, then sway the night away as Michael Troy & Company--who sold out three shows at Seacoast Repertory Theater--entertain you with Joel's and John's famous love ballads. Next Page: Valentine's Day in New England: Additional Getaway Ideas, Valentine's Day Events, Gifts and More!